A large portion of the Big East conference play has come and gone. Unfortunately, I have not been graced with the free time to cover the conference as I would have liked. That said, I’m looking forward to giving more in depth views and perspectives of not only the Big East but also the landscape of all college basketball when the calendar turns to March. Xavier (24-3, 12-2) Xavier needs to win at home against Villanova and avoid a loss in their last three games to Providence, Georgetown, or DePaul to claim the Big East regular season title. The Musketeers have all the pieces to make a Final Four run, but here’s another way to look at it: Xavier has 10 wins by 7 points or less this season. If the ball rolls out rather than in, we may be looking at a team that isn’t on the one seed line at the moment. 2. Villanova (23-3, 10-3) The Wildcats are in an odd position at this point in the year having lost to Providence, Butler, and last place St. John’s. Their defensive efficiency is great, but not the elite level we’ve come to know in recent years. It’s time for Villanova to respond because their one seed may be slipping. 3. Creighton (19-7, 8-5) Creighton losing Martin Krampelj was a hit to their squad, yet the team has responded positively by beating the teams they should have and pushing Xavier to the end at home. Creighton moves the ball very well and because of that, they frequently get open looks within 3 feet of the basket (See highlights when they hosted Butler earlier this season). The Blue Jays currently rank 2nd in the NCAA in 2-point percentage. 5. Butler (17-10, 7-7) The Bulldogs are frustrating to watch. So much talent to compete at a high level, yet the team possesses Jekyll and Hyde characteristics. I discuss more of the perspective of these inconsistent showings from game to game below. The Bulldogs need to win out the rest of the season and win a game in the Big East tournament. 6. Seton Hall (17-9, 6-7) The Pirate’s record is a head scratcher. With a team that has experience on it’s side that is combined with talent, it’s a wonder how they have not won a few more games down the stretch. I’m concerned that this is now a Seton Hall team that can be an upset for a midmajor squad in the NCAA tournament. 7. Marquette (14-11, 5-8) The Golden Eagles can light up the scoreboard quickly. With as quick they can score, they can fall cold. Their defense is not elite nor great. I don’t see Marquette doing much the rest of the season. It will be a win if they win one game in the Big East tournament come March. 8. Georgetown (15-10, 5-9) Georgetown seems to have made improvements as they have played with confidence as of late. We can go a few avenues with the narrative on the Hoyas. Looking at how they have fared since their double overtime win at home against St. John’s, they lost by one to DePaul, then by eight at Creighton, by five at Xavier in overtime, and by four at Providence. In three of those losses, Georgetown had opportunities where the ball didn’t fall their way. Close wins against Seton Hall and at Butler give Georgetown confidence as they look to stay hot through the remainder of the season. They shot a blistering 68% in the first half at Butler and still ended at 64% for the game. 9. DePaul (10-15, 3-10) DePaul seems to have most of the pieces. I watched them play in the new Wintrust Arena and it is a beautiful, modern take on a home for a basketball team. With the addition of Max Strus, DePaul has been in many more games than they have in previous seasons. They have not been able to finish games off, or this would be a different narrative being written. 10. St. John’s (14-13, 3-11) St. John’s looked like it was on its way to one of the worst outings in Big East play, but then Duke stopped by Madison Square Garden where Shamorie Ponds and the Red Storm dropped then #4 Duke. To demonstrate it wasn’t a fluke, Ponds and Co went to then #1 Villanova and upended the Wildcats. Maintaining their winning streak, St. John’s beat Marquette and DePaul. Heading into the final few weeks, the Johnnies have an outside shot at winning out and somehow finishing 7-11. I don’t think it will happen, but as the hottest team in the league, it’s tough to pick against them. Success and failure seem to stem from the ability to make shots. The Bulldogs are shooting just over 40% on mid-range jumpshots according to Haslemetrics. That isn’t a poor number, as it slots the Bulldogs at 63rd in the country. However, the decision making as of late has not been great. Questionable decisions from Kamar Baldwin and Kelan Martin have seen them dribble into traffic to make a play rather than pass. Their dribbling turns generally turns into taking a contested shot only to see the ball hit the rim and the defense grab a rebound for a quick outlet pass. Both players have combined for 13 turnovers in the last 3 games. Another telling number is Baldwin and Martin were a combined 1-13 on three-pointers against the Hoyas; the team 5-22. Knowing that they are part of something larger, The Butler Way, will hopefully reinforce the “Team over self” narrative and reintroduce the idea of passing the ball effectively over the course of the regular season. The Bulldogs lacked fire and, I’d say even go as far as to say, valor in their most recent outing at home against Georgetown. They played to not lose instead of playing to win. There was an observed hesitant approach to the game plan which made Butler look like they were a step behind on most plays. If the Bulldogs wish to see successful play here on out, they will need to play with an edge. There are a few players that have had large swings of productivity over the course of the season. Tyler Wideman, Nate Fowler, and Paul Jorgensen can all play at a high level and have shown they are capable of doing so at different points during the season. Before Paul scored a few off balance layups in the game against Georgetown, he had grown a three game shooting stretch to just 3 – 20 (15%). I feel like understanding yourself as a player would translate to taking smart shots. I think Paul is taking good shots, but the ones he is taking look rushed. Fowler, a tall center for the Bulldogs, seems to find a way to make shots more difficult than they need to be. At some point, he needs to go to the hoop strong with two hands and put the ball through the hoop without giving the entire Bulldog fan base a heart attack. Finally, Tyler Wideman is a stud, but the lack of involvement is concerning. Yes, Butler plays smaller in the middle. However, Tyler possesses immense power where he should feel comfortable going up strong, taking the hit, and ultimately earning a trip to the free throw line. Each of the three players I just spoke of are great guys. I have faith that the coaching staff and players figure this out while they find their mojo again. I need to be fair. Butler currently ranks 8th in the nation in free throw percentage, hitting at 78%. Butler has not been shooting that well compared to the entire nation since 2007 when they finished 13th. They are highly efficient on offense, with a comprehensive effective field goal percentage of 54.3%. The Bulldogs keep most opponents off the glass, limiting offensive rebounds on less than 25% of their opponents possessions. On Saturday, Butler hosts the Providence Friars in the second of two meetings during regular season play. The Friars won the first game at the Dunkin’ Donuts center. Expect Butler to come out of the locker room and play with an edge. In the midst of a three game losing streak, the Bulldogs will look to end the slide and beat a good Providence team that I expect to make the tournament. Beyond just the emotion that can play a role in this game, Butler has a much more efficient offense than Providence does. Both teams seem to be equal on defense. One of the keys is Butler limiting the amount of fouls allowing the Friars to get to the line. Kyron Cartwright moves so quickly and sees the floor so well that it will be a tough ask to slow him down. Both teams share an impressive statistic. Both have beat Villanova this year. 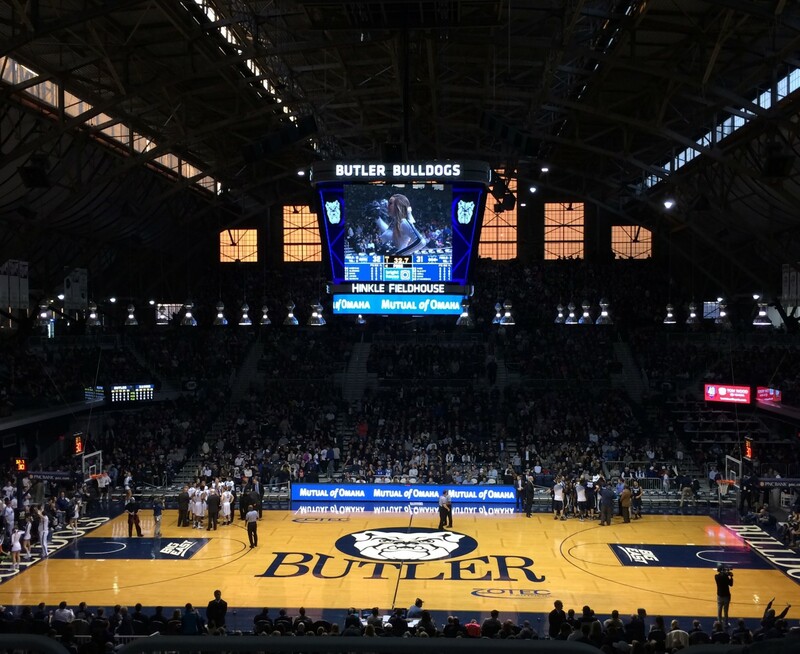 Butler did so at home on December 30th and Providence more recently at home on February 14th.